The tomb known as that of Munia Bibi seen across the adjacent stone-built tank and ghats at Rajmahal. bl.uk > Online Gallery Home	> Online exhibitions	> Asia, Pacific and Africa Collections	> The tomb known as that of Munia Bibi seen across the adjacent stone-built tank and ghats at Rajmahal. 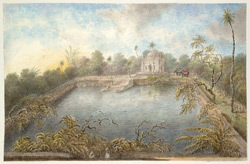 Watercolour of Munia Bibi's tomb at Rajmahal from 'Views by Seeta Ram from Malda to Gunga Pursaad Vol. II' produced for Lord Moira, afterwards the Marquess of Hastings, by Sita Ram between 1817-21. Marquess of Hastings, the Governor-General of Bengal and the Commander-in-Chief (r.1813-23), was accompanied by artist Sita Ram (flourished c.1810-22) to illustrate his expedition to Bengal in 1817 and his convalescent tour in the Rajmahal Hills in the winter of 1820-21.